How Do You Top Everest? Around sunset time on May 17, I was sitting on top of my favorite boulder outside the Base Camp dining tent, watching the clouds roll up the west ridge of Everest and into the Khumbu Icefall. The sinking sun lit the summit of Nuptse and it was a sublime moment. But I was bawling. I pulled my stocking cap over my face to make sure the Sherpas washing vegetables outside the cook tent couldn’t see my breakdown. I didn’t want them to notice because I had no good reason for my tears. Eight hours earlier, Jamie and Scott had radioed from the summit to tell us that they were standing on top of the world. Team Base Camp breathed in a collective sigh of relief, let out a few yelps and whoops, gave each other a round of celebratory hugs, and snapped a few hundred photos. That afternoon I went for a long hike toward the outpost of Gorak Shep and was elated—until I sat down on the boulder and let it sink in. After 32 months, this behemoth goal dreamed up over a bottle of wine by Jamie Clarke and Rich Noll, the CEO of Hanesbrands, Inc. had finally come to fruition. Jamie Clarke had lived up to his part of the deal and climbed Everest. In doing so, he inspired 45,000 Hanesbrands employees and countless other climbwithus.com followers that if you set a goal and put one foot in front of the other, anything is possible. So why was I crying? I suspect the tears were mostly joy at the profound beauty of the Himalayas and relief that Scott and Jamie had reached their hard-won summit and were safely descending the mountain. But I also felt a tinge of sadness that the excitement was almost over. This expedition to Mount Everest has been a defining factor in my life since the fall of 2008 when I was invited to join the team. It all started when an old colleague who I had worked with at Outside, Matt McKee, called me in the summer of 2008 to ask if I’d be interested in writing content for a corporate website “about a guy who is going to climb Mount Everest.” Having worked at Outside since the “Into Thin Air,” era, I was intrigued. I agreed to travel to Hanesbrands’ headquarters in Winston-Salem to meet Jamie and the team of bright, young HBI talent that had been picked to execute Noll’s overwhelming vision. Eventually, my content-writing job turned into an offer to join the team in Nepal. I was so excited that I didn’t think I could wait until the spring of 2010. Slowly, slowly, the expedition crept closer. To fill the time, I read books about Everest, dined with friends who have hiked and climbed in the Himalayas and grilled them about their experiences, trained on the 12,000-foot peaks that surround my home in Santa Fe, and dreamed about the day I’d finally set eyes on the most storied peak in the world. Now that I’m on week three at Base Camp, I won’t sugar coat the experience and say that it’s been easy. 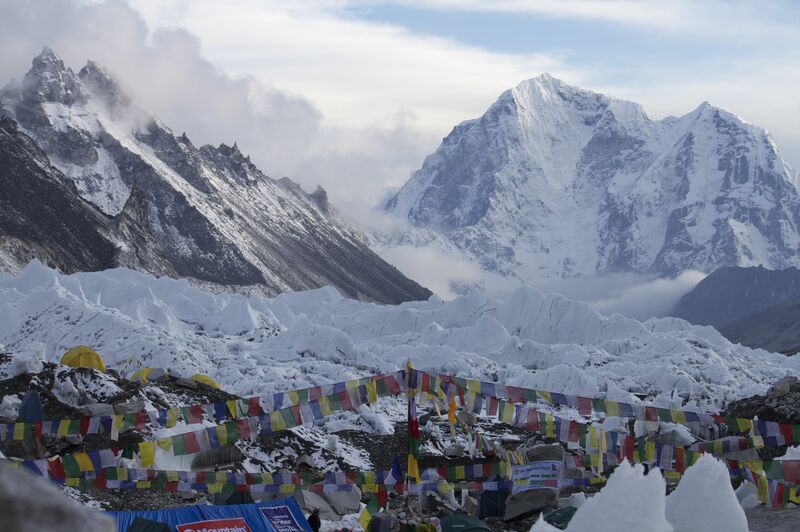 It’s hard to breathe at 17,500 feet and it’s easy to get claustrophobic living on an ever-shifting pile of rock and ice with 1,000 strangers. But those grievances are minimal compared to the bigger picture that has unfolded over the past month: I’ve watched 17-year-old high-school junior, LaQuishia Stone, barrel her way up to Base Camp, while her mom LaShonda, battled with fatigue, but still kept putting one foot in front of the other. I’ve seen the filmmakers and producers, Kenny Wilson, Adam Stone, Geoff Thompson, and Paul Mistor literally spring ahead on the trail with 15-pound cameras in efforts to take the best, most effective shots. I’ve seen Matthew Young, Charlie Stack, and Mike Abbott from Hanesbrands efficiently and effortlessly handle every last detail for the good of the team, as if it were just another day back at the office. I’ve heard expedition coordinator Wally Berg’s endless optimism as he coached Jamie and Scott through treacherous aspects of the climb; and I’ve laughed out loud as Carver High School guidance counselor Theresa Hamer coaxed us all into summing up each day into six words, most of which can’t be printed here. And then there are the Sherpas, led by brothers Ang Temba and Ang Tsering. Without their team of porters, yak herders, cooks, and cook boys, we wouldn’t have made it past the Hotel Yak & Yeti. They schlepped packs for us, fed us, boiled hot water for showers, built a stone fortress of a base camp, and taught us a thing or two about how to live in their harsh, beautiful environment. Most importantly, they taught us that Chomolungma (Everest) and all Himalayan peaks are the homes of gods and goddesses, and the mountain must be respected. What a visionary. Almost 100 years later, I’m sitting at the base of the world’s highest mountain feeling a little sad, but mostly elated that I’ve been part of a team that not only climbed the world’s highest mountain, but did it with grace, humor, and super-human will. Now only one question remains: What’s my next Everest?